Add colour and texture to your craft projects with our mixed media tutorial using the enchanting new Santoro Mirabelle papercraft collection. 1. Cut a piece of white card 6 x 6 and paint it with white chalk paint. Once this is dry, stick a 6cm band of white lace to your card and paint over in white chalk paint. TIP: Make sure your surfaces are protected with paper. 2. Cut an image from the Santoro Mirabelle Decoupage paper and stick to the centre of the card once the chalk paint has dried to create a focal point. 3. To create a border around the image, we have layered 3 frames on top of the image and added 2 layered wooden keys to the top of the frames. 4. Die cut several doilies and stick around the edges of the card, cut the edges off the doilies which are not on the card. 5. Decorate your card with a mixture of embellishments. We have added paper flowers to the top left and bottom right of the wooden frames with some pearl & diamante adornments, assorted buttons and wooden embellishments. A single Santoro Mirabelle Metal Corner has been added to the left hand corner of the card. 6. Cover the decoupage image then paint all of the embellishments with the chalk paint. 7. Die cut a doily and use as a stencil to spray over the card with shimmer mist. We have used the turquoise mister on the top and bottom of the card and used the magenta on the left. 8. Add a small amount of gold and silver wax to some of the embellishments and to the edge of your card. To finish, pearl effects dots have been placed randomly on the card. 9. Once all is dried, stick to your white card blank with double sided tape. 1. Remove the twine string and paint the wooden heart in chalky paint. 2. To give your wooden heart a textured effect, die cut a doily and cut in half. Stick both halves on the edge of the heart, cut away the edges which are not on the heart. 3. 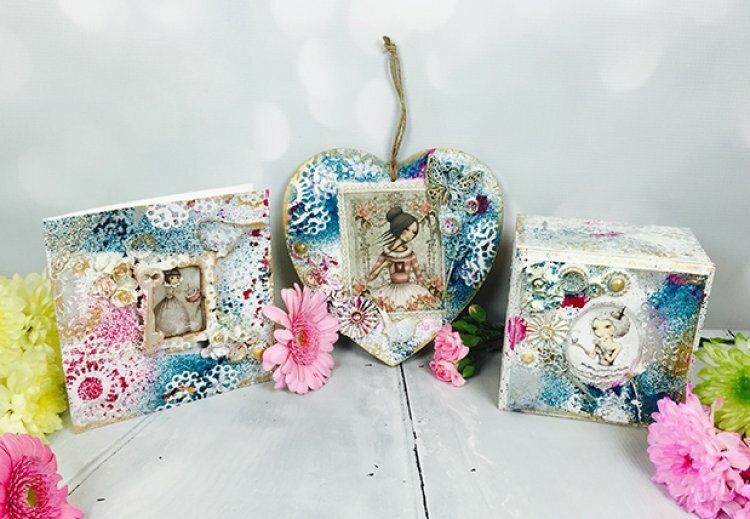 Stick your Santoro Mirabelle Decoupage paper onto centre of the heart. Frame your paper with lace. You will approximately need 38 cm worth of lace to create your border. 4. Decorate your card with a mixture of embellishments. We have added paper flowers, assorted buttons, wooden animal to the bottom left of the heart. We have then used a button, a metal butterfly and key to the top right. Stick two wooden hearts together and add a button on top to give depth to the heart. Place the wooden heart onto the lace border. 5. Once you have finished decorating, cover with Chalky Paint and wait to dry. Remember to cover your central image when painting. 6. Die cut a doily and use as a stencil to spray over the card with shimmer mist. We have mainly used the turquoise mister on the heart and used the magenta mister on the embellishments and sprayed randomly. 1. Paint your box and lid in chalky paint and wait to dry. 2. Die cut several doilies, cut into sections and place around the lid and box. 3. Place a piece of Santoro Mirabelle decoupage paper to the centre of the lid. 4. Decorate the gift box lid with paper flowers, we stuck three to the left hand corner and surrounded them with a Santoro Mirabelle metal key, pearl and diamante embellishments, accordion sticker and buttons. To finish, stick a wooden bird to the right hand corner of the lid. Once you have finished adorning your lid with embellishments, cover using the chalky paint. 5. Die cut a doily and use as a stencil to spray over the gift box and lid with shimmer mist. 6. To complete your gift box, add gold and silver wax to some of the embellishments, to the edge of lid and doilies surrounding the gift box and lid. Have you made anything with the new Santoro Mirabelle collection? We would love to see them so remember to share them in the project gallery.